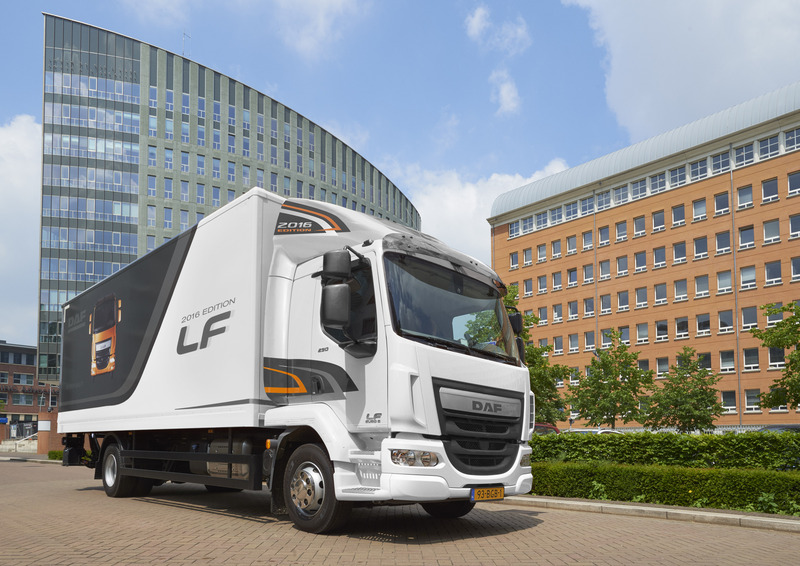 DAF introduces LF 2016 Edition - DAF Trucks N.V.
DAF is introducing a large number of innovations to the popular LF series for distribution transport. Optimised drive lines, a new aerodynamic package and an even greater choice of wheelbases and fuel tanks contribute to an even higher return per kilometre. Most LF 2016 Edition models also have the latest comfort and safety technologies fitted as standard, including AEBS, FCW, ACC and LDWS. 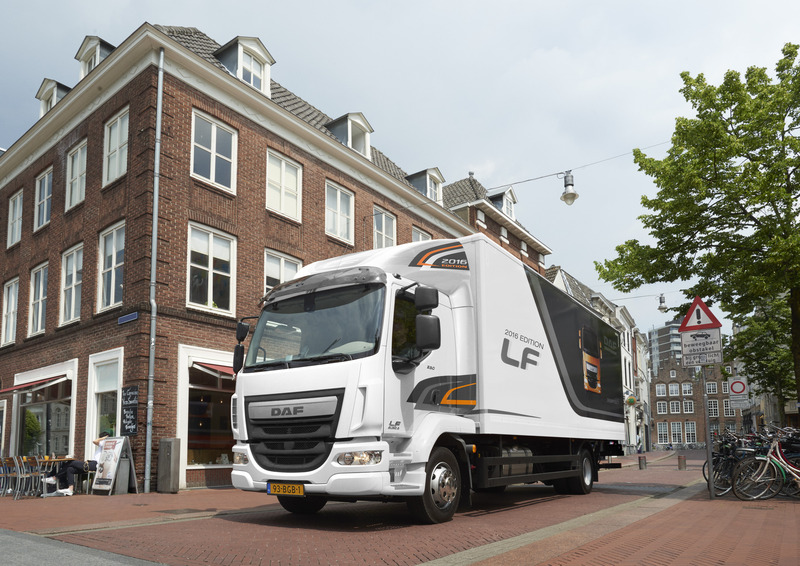 The numerous innovations DAF is introducing for the LF series fit seamlessly into the philosophy of DAF Transport Efficiency: lowering operational costs and further increasing profitability. This also applies to the new LED rear lights with their extremely long service life, the new Frigoblock generator preparation for the 4.5-litre PACCAR PX-5 engine and the central display on the dashboard, which now also provides tachograph information, including driving hours, the next scheduled service and about the bodywork. The new LF 2016 Edition features optimised drivelines. Enhanced software and even better heat and air management in the exhaust gas after treatment system, make the 4.5-litre PACCAR PX-5 engine (112 kW/152 hp – 157 kW/213 hp) up to 5% more fuel efficient. 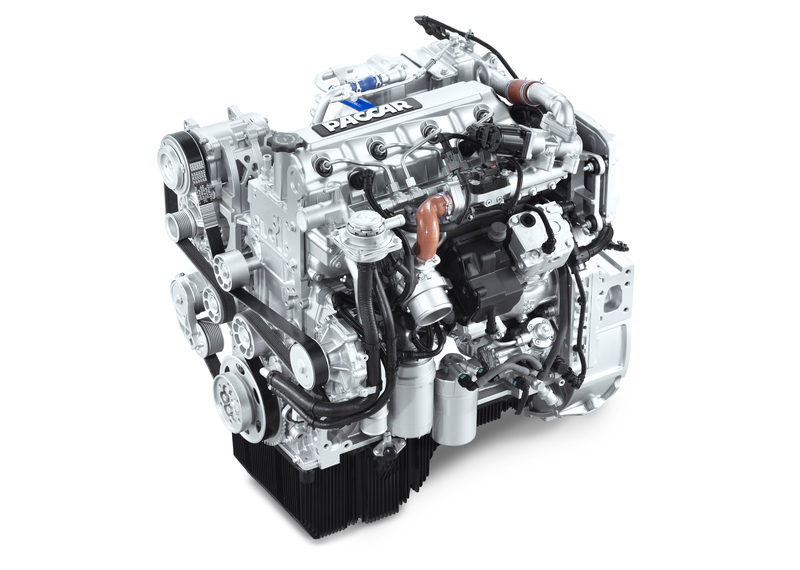 The 6.7-litre PACCAR PX-7 engine (164kW/223 hp – 231 kW/314 hp) is now also available with an optional automated AS Tronic transmission with 12 speeds. Compared to the existing automated 6-speed gearbox, this allows higher GCWs of up to 32 tonnes for extra productivity. Furthermore, lower engine speeds to enable even lower fuel consumption and further reduce interior noise levels. One of the major advantages of the new LF 2016 Edition is the expanded ability to tailor a vehicle to its specific use, thanks to the seven new wheelbases with lengths up to 6.90 metres. This allows load lengths of up to more than 9 metres for maximum load capacity. The longer wheelbases enable fuel tank volumes of up to 1,240 litres, which is unique in this distribution truck sector. This results in an even greater range, maximum vehicle availability and financial benefit by refuelling where fuel prices are at their lowest. To ensure optimum aerodynamics and provide the best possible fuel consumption, DAF has developed new cab collars and a completely new roof deflector for LF models with a day cab. The roof deflector is available both for low and high bodies and, together with the new collars, fits perfectly with bodies between 2.50 metres and 2.55 metres wide. The new aerodynamic package enables fuel savings of up to 4% compared to the current package. 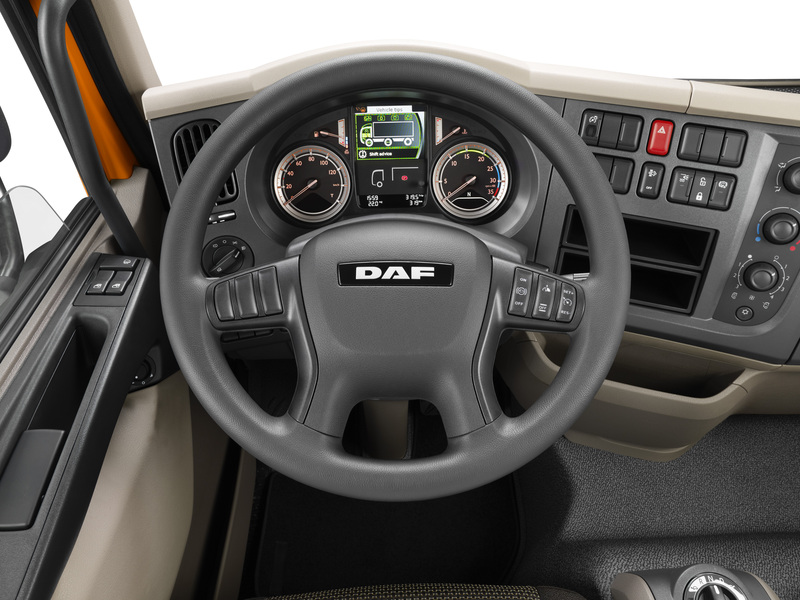 In other areas as well DAF has introduced innovations which benefit efficiency. A new air intake directly behind the cab provides optimum air flow for whilst allowing fitment of options such as height-adjustable roof air deflectors, over-cab refrigerator units and top sleeper conversions. Especially for refrigerated transport, the DAF LF 2016 Edition can now be ordered pre-prepared for a Frigoblock generator (water cooled, 22.5 kW), in combination with the four cylinder 4.5 litre PACCAR PX-5 engine. New LED rear lights, which are already offered on the CF and XF, are available as an option and will in principle last the whole service life of the truck and are also energy efficient. Another example of DAF Transport Efficiency. DAF’s Driver Performance Assistant on LF, CF and XF models provides the driver with detailed feedback on fuel economy, braking behaviour and the way the driver has anticipated traffic situations. As from the new LF 2016 Edition, tachograph information is now also shown on the central information display. This allow drivers to monitor vehicle speed as well as their driving hours more effectively to avoid infringements. The screen also displays when the vehicle's next service inspection is due, ensuring timely maintenance. Based on the driver card, the display switches automatically to the preferred language, a useful feature for the driver. Information about the body and auxiliary equipment can also be shown on the central display; for example, if the loading crane is not fully folded in or the stabiliser legs are not secured. This is possible thanks to the enhanced communication between the chassis and body; this also ensures, for example, that the body ‘knows’ whether the transmission is in neutral. In addition, the PTO and engine speed, amongst other things, can now be controlled via the central vehicle CAN, both from the body and from the cab, for maximum efficiency and convenience. Adaptive Cruise Control (ACC) automatically adjusts the speed of the truck to match the speed of the vehicle ahead. As a result, a safe distance is maintained between the two vehicles. This enables cruise control to be used as much as possible, which benefits fuel economy. Lane Departure Warning (LDWS) works with a camera behind the windscreen. If the truck unintentionally leaves from its lane, an acoustic signal warns the driver. 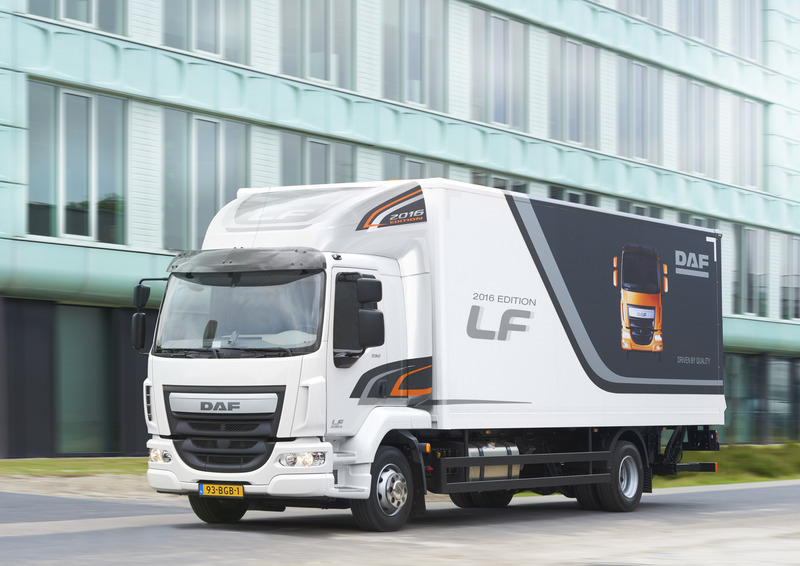 The many innovations mean that the DAF LF 2016 Edition represents a major step in further enhancing truck efficiency, in line with the philosophy of DAF Transport Efficiency. The key features of the DAF LF are of course maintained, including the high load capacity thanks to the low kerb weight, easy manoeuvrability thanks to the smallest turning circle in its class and the high comfort and easy handling so valued by drivers. 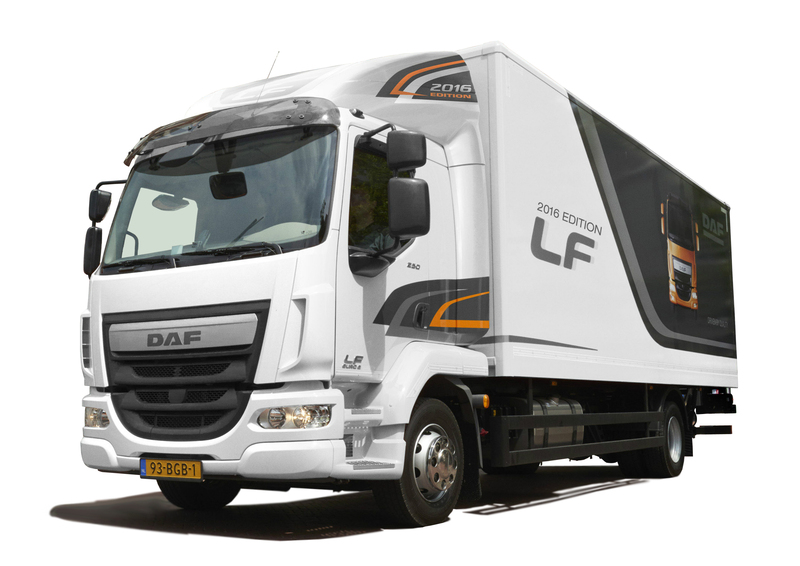 Production of the DAF LF 2016 Edition starts in December.